For photobooth hire on the Sunshine Coast, Maleny and Hinterland areas, In the Booth has the perfect solution! If you’re looking for a relaxed, stunning location for your next event, the Sunshine Coast has it all! Sandy white beaches stretching from Caloundra to Noosa, incredible views from the Montville & Maleny Hinterland and the rolling green hills in between. 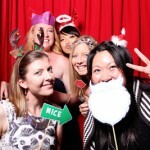 Photo booth hire Sunshine Coast style will make your event a hit! We cater for any event whether it is a stunning beach wedding, rustic reception or a corporate getaway; the coast has it all! Hi! 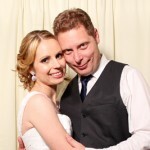 We’re Dave & Katie the husband and wife team that make up In The Booth Sunshine Coast! We are newlyweds who love a good challenge and creating amazing events. We have a passion for what we do and thrive on delivering high quality products and services to our clients. Nothing satisfies us more than the sounds of laughter, joy and memories being created. Not to mention the wow factor the booths bring to every event. Our love for the event industry flourished over three years ago when we started our first award winning business within the field. We’re thrilled to now be running In the Booth Sunshine Coast and providing this amazing experience to our clients and guests. With our skills and Industry knowledge we bring you the best photo booth experience you and your guests can ever imagine. In our little spare time we love everything Cars, Racing and Speedway! Lucky for Dave we both get a kick out of his hobby of motor racing. You can find Katie on the sideline cheering him on! We would love to hear from you and find out how we can assist with making your event one you will never forget, or if you just want a chat then that’s fine too. For Sunshine Coast photo booth hire email, please get in touch! "Hi In the Booth, I am just writing a quick thank you letter for providing your booth last Friday night at our wedding in Sunshine Beach. The Booth attendant (Jay) was an awesome guy and ran it very well. We could not have been happier with the way he looked after everything on the night. His professionalism on the night will definitely generate further business for you down the track. On behalf of Laura and myself, we just wanted to say a big thank you to your team for making our night awesome." "Just want to say thanks to all involved, especially Luke, for a fantastic night. I think our Christmas party 2013 will go down as one of the best ever and I think the fun of the booth certainly added to that. I don’t think there was a minute when the booth wasn’t occupied. Luke was great! Very helpful, friendly and professional. And your design department created a really great strip layout that I know everyone was really surprised with. I’m sure there will be demands to have you back next year." "Thank you so much for the photos, we received them within a few days from your email. They are great! Everyone had an awesome time with the booth, I have always loved them, they are so fun! The wedding and the reception was great, and the photo booth really added to the event. Thanks again, your team have been so helpful throughout the booking process. We hope your attendants enjoyed themselves as well (as much as they could anyway while working!)" 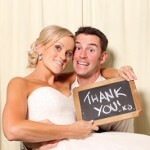 What is it you love about providing photo booth hire services on the Sunshine Coast? Everyone seems to have taken a deep breath of the wonderful sea breezes and relaxed a little! Being one of Australia’s premiere tourist destinations, it’s hard to fault the wonderful service that the venues of the Sunshine Coast offer which provides a stress-free and seamless experience for our clients. Tell us about some uniquely Sunshine Coast touches you have seen at an event? The sunsets from any location on the Sunshine Coast are truly breathtaking. From many beach side ceremony locations from Caloundra to Kawana to Coolum to Noosa, you will see the sun moving over the water then setting behind the stunning Montville & Maleny ranges or the wonderfully pointy Cooroy Mountain. It’s amazing to be able to capture photos of such beautiful surroundings, on top of the hilarious memories you’ll capture in your photo booth. Do we provide props… Yes! We have a classic props range available at no extra cost with every hire option. These include high quality stick props that we can sanitise and have fresh for each event, (you wouldn’t believe what we’ve seen!) and a custom chalkboard for personal photo-messages. Of course you're also welcome to add anything to this collection for that personalised touch if you wish. Relax and remember to go slow! Your guests aren’t going to notice what the napkin looked like or whether they had a ribbon around their seat – only you will sweat on the small stuff! And with our photo booth hire services, you won’t have to worry about a thing! Put your energy into spending time with your guests and celebrating the reason everyone has come together! When on the Sunshine Coast you must… ? Relax on the beach and do… nothing! Watch the sun set over the water (rare on the east coast!) from Bulcock Beach, Caloundra or Noosa Main Beach, Noosa Heads. It is just breathtaking! Just remember to pack that bottle of wine! If you’re into adventure you can climb one of the many mountains the Coast has to offer including Mount Coolum or the Glasshouse Mountains. And finally head up to through Flaxton on to Montville and Maleny to see the incredible views from the Hinterland back over the Glasshouse Mountains and the entire Sunshine Coast! You can see all the way from Brisbane to Gympie! Whatever you do, it must involve being outside in the glorious sunshine that is offered 99% of the year! Photo booth hire on the Sunshine Coast is great for outdoor events as we have beautiful weather all year round.